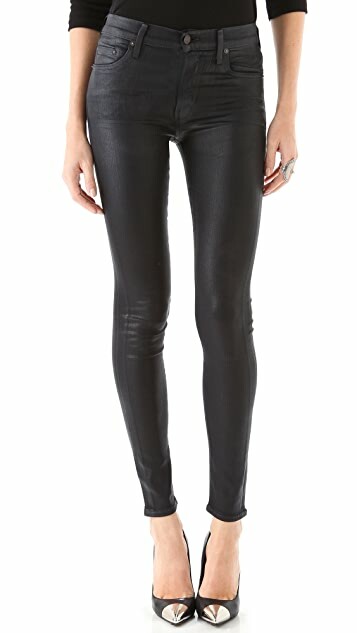 A leather-like coating gives these 5-pocket skinny jeans a luxe, satiny feel. Button closure and zip fly. 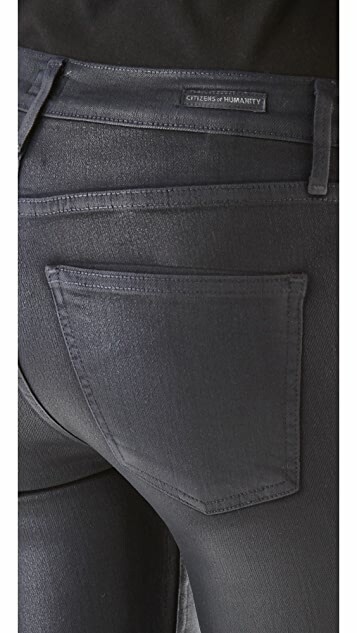 These jeans are exactly as pictured, if not better. They are very comfortable, true to size, and have a great color. Love them! I love the color and the fit. Awesome pants! Took the advice of other reviewers and ordered my "smaller" size. I am typically between sizes and going down was perfect. They looked really tiny when I held them up, but pulled on real easy and are super comfortable. They have a great sheen without sparkle and I have been asked on more than one occasion if they are leather. I like the rise, as it works well with lots of different pairings and the color is great to work with as well. I have a short inseam, but the bunching works with the very narrow leg opening, not too much bulking. After four wears not any extreme stretching. Normally a 26 in citizens. Even though reviews suggested to size down I took my normal size. Fits perfect. More comfy than my coated j brands. I am a true 26 and a 25 would have been too snug/caused the coating to break. 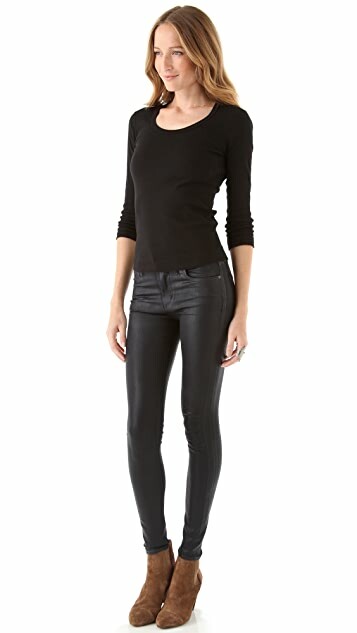 These jeans are gorgeous, but after talking to a few people who have worn them and then had them dry cleaned, they all say that after the first wash the coating is gone. For me that wasn't worth keeping them. They do fit great, but again the fact that the coating doesn't last long made me return them. Love the colour and the fit! First pair of coated jeans and my first pair of Citizens of Humanity. I love that the rise is a bit higher, the Venetian blue colour is fantastic, length is perfect (I am 5'8") and they have just the right amount of shine and pizazz. Really pleased. Will certainly buy Citizens of Humanity jeans again.